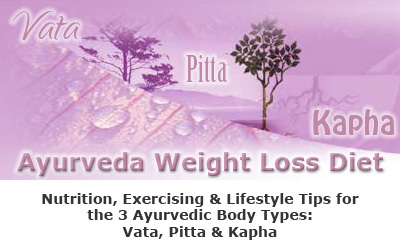 Discover here the basics of Ayurveda Diet, a proven weight loss nutrition program for the 3 Ayurvedic body types, or doshas: Kapha, Pitta & Vata. Open any health or fitness magazine and you’ll see articles on Ayurveda diets and treatments everywhere. Why the increasing reach of Ayurveda, you ask? Well, with its millenary wisdom-inspired, holistic approach to regaining health and unfailing results of releasing the extra weight, you shouldn’t be surprised that the Ayurvedic diet is increasingly popular in the United States, Canada and Western Europe. Accredited Ayurveda training is becoming more and more accessible in the West. How can you benefit from the raising popularity of Ayurveda? If you struggle with some extra pounds you can find experienced Ayurveda practitioners closer to home (or online) to work with. They are well-trained, credentialed, and can guide you so you can make the best of Ayurvedic weight loss. … or a lose-weight-fast (and putting it back on even faster) program. You see results gradually, but they are long-lasting. optimize the absorption of carbohydrates – as a result, you stop experiencing those nasty hunger pangs, food cravings or unpleasant moods. 4) Natural stress relief – through deep breathing and simple relaxation techniques to eliminate chronic stress – the biggest cause of weight loss resistance. Are you ready to take your Ayurveda training one step further? Then let’s talk for a moment about the first two elements of Ayurveda diet: cleansing and nutrition; then we’ll continue with relaxation techniques & exercising in Ayurvedic weight loss. Regular cleansing, or detoxifying your body is a key part of any Ayurveda training. According to this millenary system of healing, nature supports cleansing of your body in spring – just like the warm weather that melts the snow in spring, this season has a similar effect on your body’s toxins. What happens if you don’t do a detox regularly? Well, your body becomes clogged with toxins, making you prone to flu, colds, cough, and allergies. You might even feel fatigued, sluggish, and experience wild hunger pangs. It cleanses your liver, blood, sweat glands, and elimination organs, preventing the build-up of toxins in your muscle tissue. As a result, you lose a few pounds almost immediately, feel energized, and sleep better. Your complexion clears, you concentrate better and your mood greatly improves. You start rebuilding your health and feel rejuvenated – that’s the main focus of any Ayurveda training. 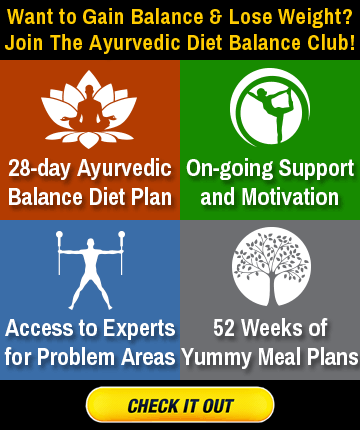 Is Ayurveda Diet an Easy Weight Loss Nutrition Program? That’s because Ayurveda’s paramount concept is using the right nutrition for your specific body type, or dosha. As you know, any weight loss program that’s based on your body type takes you half of the way to dropping the pounds easily, naturally and for good. if your body type is Kapha, your body’s energy is predominantly “moist & cool” and you can balance your dosha with Kapha Diet: favor raw vegetables, warm drinks, and spicy foods and avoid salty, deep fried foods, sweets, ice cream, and any cold drinks, as they increase, or “aggravate” your Kapha constitution. You should know that in any Ayurveda diet weight loss nutrition program it’s equally important WHEN you eat, too; that’s because eating foods when they are in season restores your body’s natural biorhythms and is one of the best ways to speed up your metabolism for a maximum fat-burning power. Also, when lunch is your biggest meal of the day, you match the natural circadian rhythm, when your digestion and assimilation are at their peak (around noon), further increasing your metabolism. Traditionally, Ayurvedic diets do not include meat (except for some very specific medicinal purposes). Well, part of it is because in Ayurvedic spiritual tradition all Life is sacred and honored as such; slaughtering animals and eating their flesh contradicts the idea of respecting and practicing non-violence towards all Life. However, more permissive versions of Ayurveda diet stemmed from a desire to cater to a larger and more diverse audience. These modern adaptations allow people who aren’t necessarily subscribed to the consciousness/spiritual aspect of Ayurveda (or just aren’t comfortable with not eating meat), to benefit from its highly effective balancing health protocols. That’s why all dosha-specific Ayurveda diet plans presented here contain meat. If you’re a vegetarian simply take the meat out from the plans using the other nutritional guidelines. You’ve got now a good Ayurveda training primer for detoxifying and nutrition; next, find out more about exercising and relaxation techniques in Ayurvedic weight loss.